Experience something different this Christmas with transport from Seattle to the picturesque Bavarian village of Leavenworth in the Cascade Mountains. 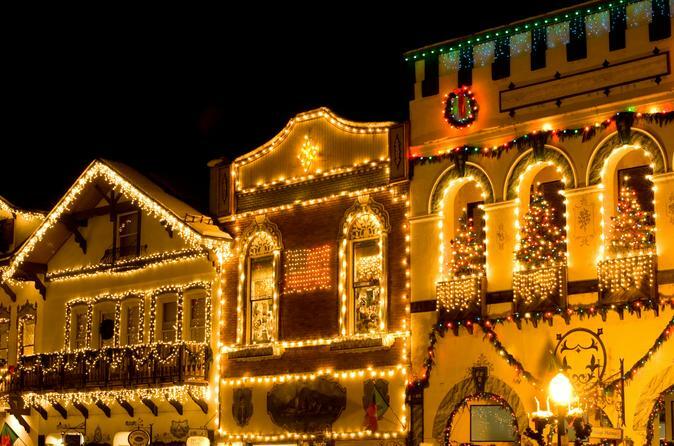 Arrive at the annual, admission-free Christmas Lighting Festival to browse quaint old-world shops, savor authentic German food from street stands, enjoy live outdoor entertainment, and take an optional horse-drawn carriage ride (at own expense). Gather at dusk for the Christmas lights ceremony, where you’ll be dazzled by a spectacular display of glittering Christmas lights! Head to the Museum of Popular Culture in downtown Seattle in the morning to hop aboard your comfortable coach. After crossing Lake Washington, pass through Issaquah, and then make your way east to the heart of the spectacular Cascade Mountains, by way of Snoqualmie and Blewett Passes. When you arrive at Leavenworth, you’ll feel as if you’re a world away from metropolitan Seattle. This authentic Bavarian-themed village is nestled in the snow-covered mountains, enveloping you in old-world charm and picturesque scenery usually only found in Europe. You’ll have the whole day to explore this wonderful German mountain village at your own pace. Shop at the village’s quaint themed shops, savor authentic German food from street stands and local eateries, enjoy live outdoor entertainment, and take an optional horse-drawn winter carriage ride with your family or loved one (at own expense). Gather at dusk for the Christmas lights ceremony as the buildings, the promenade and the Christmas trees suddenly burst ablaze in hundreds of thousands of twinkling lights. Savor this special Christmas moment with your friends and family – an experience you’re sure to remember forever! After the lighting ceremony, hop in your mini-coach and relax on the 2-hour drive back to Seattle. Please note: This tour is seasonal and only operates on Saturdays during the month of December.